Outsourcing corporate eLearning development is an established practice and has been there for over two decades now. The success stories across the world clearly highlight that it delivers the required benefits. Based on a Docebo report, companies allocate roughly 42% of their budget on outsourced online training services. This is a strong indication that organizations acknowledge the importance of investing in L&D in order to improve training ROI. They know that hiring a trained eLearning professional will provide them with the experience and skills they require. Traditional classroom training involves a lot of travel. eLearning has the potential to reduce the combined cost by as much as 70%. However, outsourcing eLearning gives you the ability to reap these budget benefits, even if you don’t have the time or know-how. Larger organizations tend to outsource more of their online training needs than mid-size organizations. In fact, 60% of large companies reported that they outsourced some, if not all, of their online training efforts. This may be attributed to the fact that eLearning is so flexible and adaptable, as it is constantly improved to match industry standards. 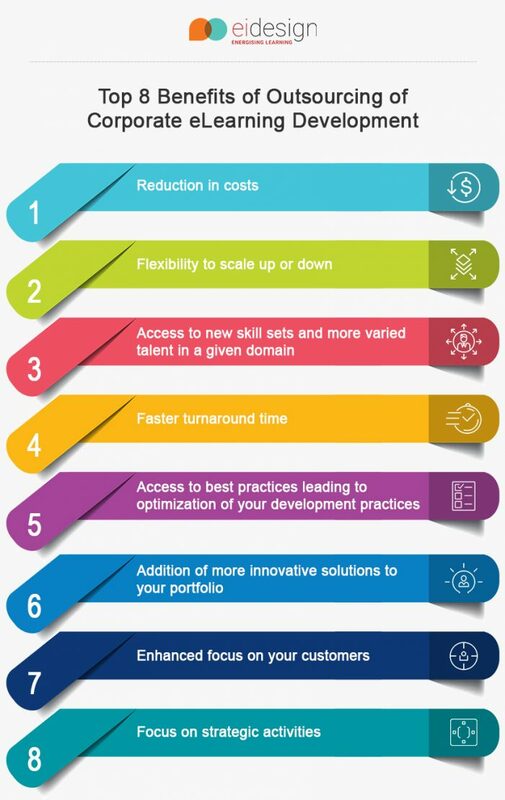 In this article, I highlight the top 8 benefits for which outsourcing of corporate eLearning development is done. Then I share 5 practical tips that you can use to maximize this gain. This typically is the first reason and the most obvious benefit that the outsourcing of corporate eLearning development brings to the table. Furthermore, it brings the added value of getting more done in a shorter time with the required quality. The organizational business needs are dynamic, and they often lead to headcount increase/reduction to manage the training needs. While this is difficult to do with your in-house team, this flexibility to access additional resources, when needed is the second biggest benefit that outsourcing of corporate eLearning development offers. Authoring tools and related technologies are changing so rapidly that it is virtually impossible to keep track of all of them. Equally tough is the mandate to have in-house expertise across all of these. This is where outsourcing corporate eLearning development gives you yet another significant advantage as you can now bridge the specific skill gap with ease. 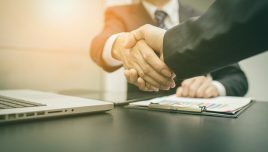 Most outsourcing partnerships give you access to a dedicated talent pool that can be used to complete your projects in a relatively shorter time. While you may have a great in-house practice for eLearning content development, there is always room for further improvement and optimization. This too is possible as you consider outsourcing corporate eLearning development wherein your partner’s capabilities can help you enhance your current approach further. While most eLearning development organizations have access to a similar portfolio of tools and technologies, your partner can add value to your learning designs through innovative and creative Instructional Design approaches. Whether you are servicing internal or external customers, outsourcing the development of your eLearning content provides your internal team with additional bandwidth to pick up other related aspects. These could help you devote quality time with your customers that can help you create further business opportunities. As an extension, the delegation of outsourcing corporate eLearning development frees up your team’s calendar that can be better spent on strategic initiatives. 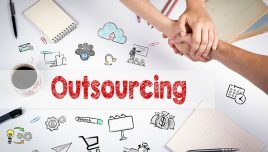 What Are The Tips That Can Help You Maximize Tthe Gains from Outsourcing Corporate eLearning Development? Now, I share 5 practical tips that will enable you to maximize the gains from the outsourcing corporate eLearning development initiative and see gains beyond the benefits highlighted here. There has been a sea change in the online training offering in the last couple of years. There has been a significant transition in many aspects including the change in devices learning happens on (read smartphones) to the kind of learning experiences learners want (read microlearning, video-based learning, gamification, and so on). As a result, these aspects need to be incorporated into your charter, and this new set of needs should be used as you outsource corporate eLearning development. Look for a partner who can fulfill these learning approaches. Whether you select an onshore, a near shore, or an offshore partner, the success of outsourcing corporate eLearning development hinges on the model that is in place. Look for a partner who has the required frameworks for online collaboration, communication, and review to maximize your gain. The usage of Agile development methodology is an established practice in software development. 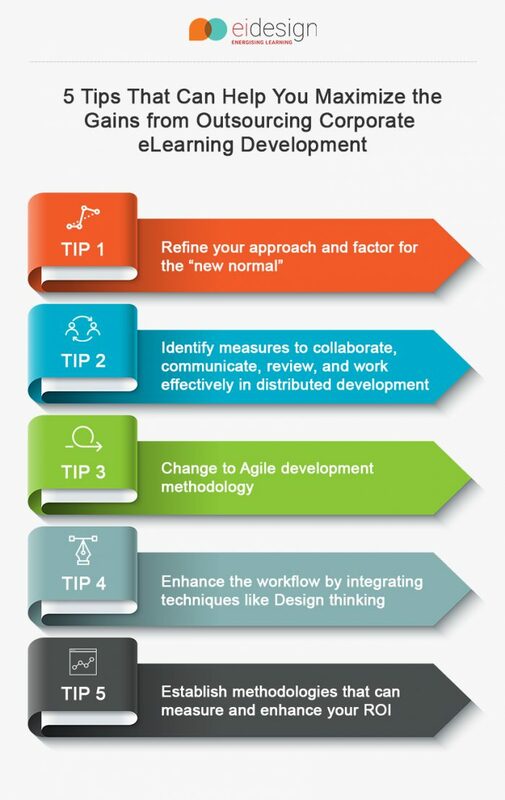 Now, its usage in eLearning content development has created a different approach that focuses on an iterative process that emphasizes continuous quality improvement. It includes “huddles” that bring all stakeholders (yours and your partner’s teams) on the same page. The development happens over small chunks that are built in short “sprints”. There is room to iterate and enhance the learning experience at each sprint. It reduces the overall development time and provides higher predictability. This is another significant aspect that you should look in a partner for as you carry out outsourcing corporate eLearning development. As an extension of the Agile approach, you should also evaluate the integration of the design-thinking approach that enables your team to collaborate innovatively with partner teams. The result is a solution that aligns better with your mandate. This, too, is an important aspect that you should look for as you outsource your corporate eLearning development. Look for a partner who can work with you not just for content development but who can add value across the spectrum from Training Needs Analysis (TNA) to training evaluation and ROI computation. I hope this article provides insights into the benefits of outsourcing corporate eLearning development. I hope my tips will help you reap further gains from the outsourcing of your corporate eLearning development.